WordPress Image Attributes made simple. 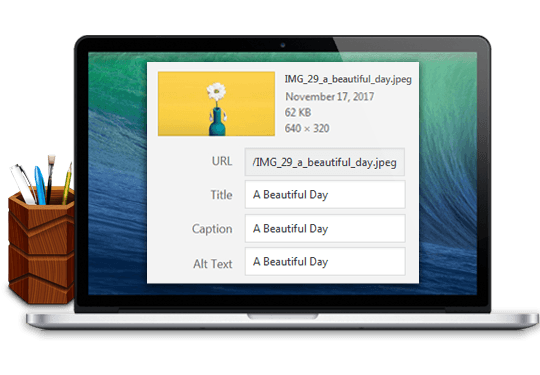 Image Attributes Pro automatically generates image attributes from image filename or post title. We have built it all in so that you can focus on writing great content. Image Attributes Pro will generate image title, alt text, caption and description right when you upload the image. Use the bulk updater to clean up existing images on your WordPress website as well. Not just new uploads. Feel like using image filename for image title and post title for alt text? You got it. The advanced filters can be used to clean up your image filenames as well. Filter out characters or words from image filenames with custom filteration options. Regex supported! Update alt text only if they not exist? Update only what you want. Set your options in the clean well organized interface. Use your plugin on all your websites. Yes, on your client websites too! Extensive product documentation and priority support served with love. Update image attributes on your entire WordPress website in one click! "Exactly Perfectly What I Was Looking For"
It is nicely thought out, quick, with a well designed easy to use interface. See how Image Attributes Pro looks under the hood! Every license includes all features and professional support. "Fast & Simple Time Saver"
Download, install, then go to settings to decide how you want to handle meta data for your images. Save settings then import images into media and see the magic.This plugin will save me a LOT of time! Great plugin! Feel free to get in touch if you have an infrequent question. Does the bulk updater update image attributes inside posts? Yes. The bulk updater updates image title and alt text for images inserted into posts and custom post types. Can I use the plugin on my client websites? Yes! Feel free to use the plugin on all of your client websites. Will I be able to use the plugin after the license expires? Yes. The plugin will continue to work and you will still be able to use it. However, you will no longer receive updates and support until you renew your license. Do I need to uninstall the basic plugin to use the pro plugin? No. The pro version is an add-on to the basic plugin and needs the basic plugin to function. Does the plugin work with Custom Post Types? Yes! Image Attributes Pro is designed to work with custom post types, in addition to the default posts and pages. Will it bulk update image attributes for WooCommerce products? Yes, of course! WooCommerce products are simply custom post types and the bulk updater updates image attributes for WooCommerce products like a champ. SEO friendly product images for your store in one click. What if it doesn't work on my website? The plugin is coded to WordPress standards and should work on any standard install. In case it doesn't and if we cannot fix it for you, then your money will be refunded. Please get in touch if you have a specific requirement. A snapshot of everything Image Attributes Pro is designed for! Insert Image Title into post HTML. This will add title="Image Title" in the <img> tag. Use title casing. First Letter Of Each Word Will Be Capitalized. Use sentence casing. First letter of a sentence will be capitalized. Clean actual image filename after upload. Use post title as title text. If image is not attached to a post, image filename will be used instead. Use filename as alt text. Use post title as alt text. If image is not attached to a post, image filename will be used instead. Use post title as caption. If image is not attached to a post, image filename will be used instead. Use post title as description. If image is not attached to a post, image filename will be used instead. Update image titles / alt text in media library only. Image titles / alt text in existing posts will be left unchanged. Update image titles / alt text in media library and existing posts. Update image titles / alt text in existing posts only if no title / alt text is set. All image titles/ alt text in media library will be updated.